KRAKOW, POLAND - AUGUST 7, 2017:The Juliusza S?owacki Theater was opened in 1893, on the style of the Vienna Opera. 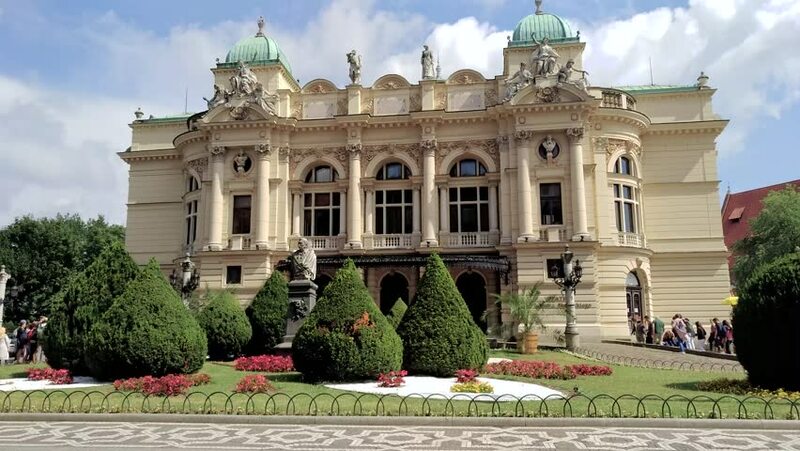 Inside you can admire the famous curtain created by the painter Henryk Siemiradzki. 4k00:28BAVARIA, GERMANY - SEPT 2014: Linderhof Palace with tourists Bavaria Germany. Schloss smallest of three palaces built by King Ludwig II. One of most beautiful creations of historicist garden design. 4k00:28BAVARIA, GERMANY - SEPT 2014: Linderhof Palace with tourists Bavaria Germany. Palace built by King Ludwig II. He built three famous palaces or castles; Neuschwanstein, Linderhof and Herrenchiemsee. 4k00:20VIENNA, AUSTRIA - SUMMER, 2017: Vein. Vienna. Wien. Kursalon Hubner. Concert hall in unsere garten. Austria. Shot in 4K (ultra-high definition (UHD)). 4k00:35BUDAPEST, HUNGARY - SUMMER, 2015: Budapest. Architecture, old houses, streets and neighborhoods. Hungary. Shot in 4K (ultra-high definition (UHD)).